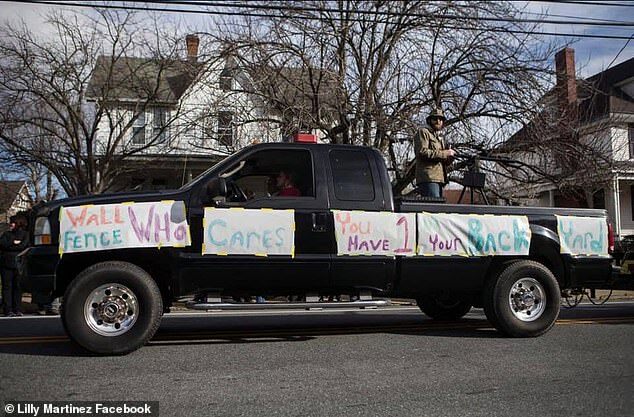 The mayor of a Delaware town that hosts an annual satirical parade on New Year’s Day has promised new rules after one of this year’s floats was deemed ‘offensive’ and ‘racist’. 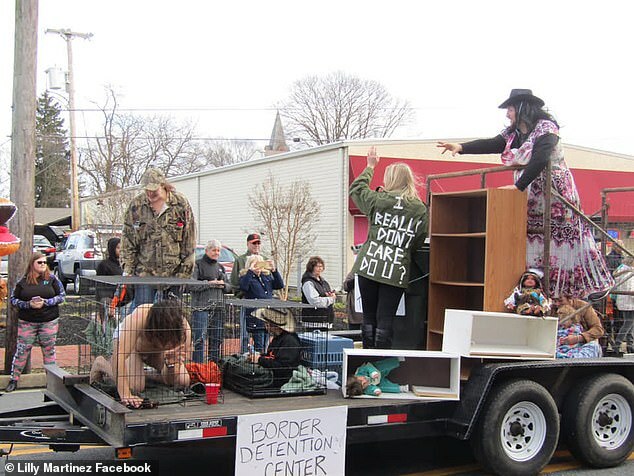 The 2019 parade sparked outage after spectators noticed that a ‘Border Detention Center’ float featured a woman wearing an imitation of Melania Trump’s ‘I really don’t care do you?’ jacket – with a ‘migrant’ child at her feet in a cage. 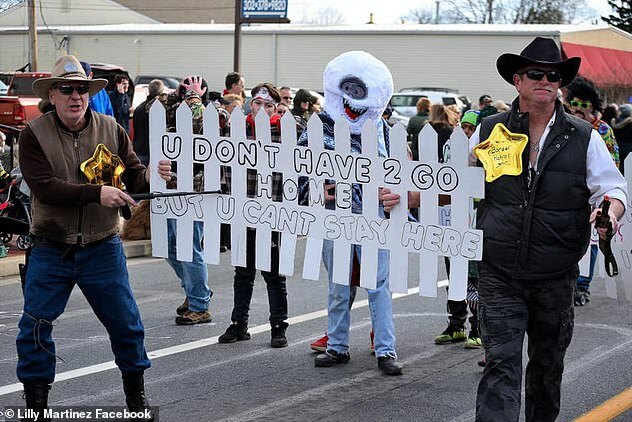 Protesters held signs reading ‘Build Kindness Not Walls’ and ‘White Silence=Violence’ during Monday’s town hall in Middletown in anger over the offensive float. Middleton’s Hummer’s Parade, a spoof of Philadelphia’s annual Mummers Parade, often features political themes and many people dressed as Donald Trump. But many felt that the controversial float had overstepped the line. Mayor Ken Branner announced the formation of a committee comprised of seven locals who would come up with guidelines for the future parades. Javier Torrijos, chairman of the Delaware Hispanic Commission, was one of the 200 people attending the meeting and was one of the first to speak about the float’s impact. ‘We can’t tolerate these types of parades that are extremely racist in nature against immigrants and members of groups who are the target of expressions of hatred, discrimination, oppression and exclusion,’ he said. 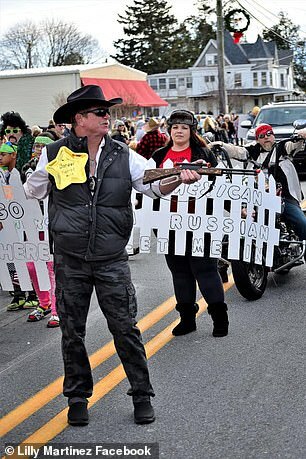 The Hummer’s Parade in Middletown attracted a social media backlash after a host of politically incorrect floats were rolled out before spectators on New Year’s Day. 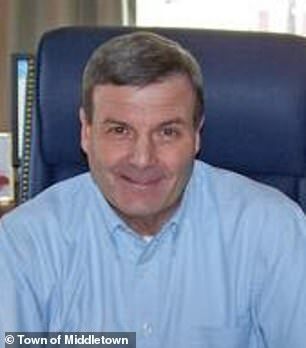 Hansen, a Democrat, said it was not just distasteful but went far beyond what is acceptable. ‘This went more than close to the edge. It went over the edge and it has to be called out,’ said Hansen, who saw the display in person. Many of the floats featured people dressed as Donald Trump wearing grinning orange-faced masks. Portrayals of the president could be seen riding atop a nuclear missile and waving to crowds on a military truck. 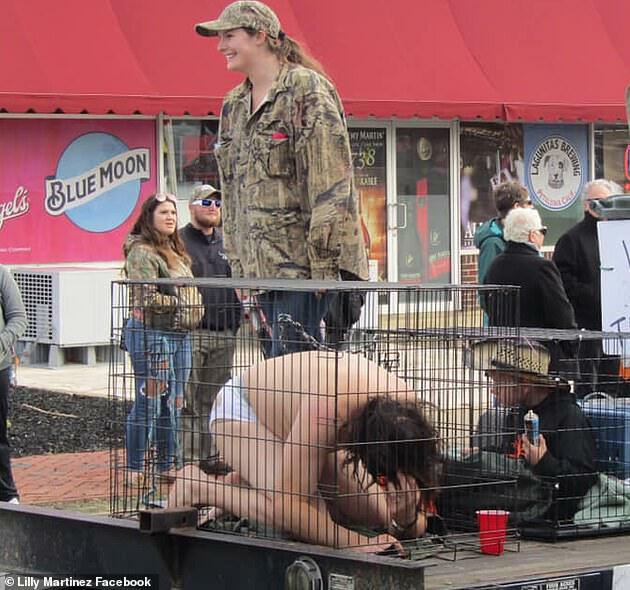 Posting on their Facebook page, the Delaware Democrat Party wrote: ‘It’s not satire if it’s not funny and it’s not funny if it’s as racist and dehumanizing as the policy it references. ‘There is plenty of room in our political discourse for parody, but this clearly crosses the line. But parade participant Michael Wipf, who hid baby dolls taped to his chest under a blanket and walked alongside signs reading ‘Not Mexican I’m Russian Let Me In,’ said people who don’t like the parade don’t have to attend. Fahey was the scheduling secretary for then-Gov. Tom Carper who was killed by her former boyfriend in 1996. He stuffed her into an ice chest; her remains were never found. In 2007, NFL quarterback Michael Vick pleaded guilty to his part in a criminal dogfighting enterprise, leading to jail time and suspension from the league. A native of Townsend who now lives in Virginia spearheaded the controversial float. John Bingham hinted during the line-up that the dog cages on a trailer were not all they had planned. Jack Schreppler, the parade’s self-proclaimed ‘disorganizer,’ said in an email Thursday that he leads the parade but he doesn’t regulate the content. Mayor Kenneth Branner said the town isn’t involved with the parade other than to provide police for traffic control.